Wow, I can’t believe it’s almost been an entire year since the last PAX Australia (Penny Arcade Expo). That time signalled a huge change in the development of Tempest, where Fox Tale Games joined the Tabletop Games Designer Australia (TGDA) group – a group of dedicated Australian designers of board games. Among their ranks are designers of amazing games like COGZ, Burger Up, Monstrous, the recently very successful Unfair and Skyward. I will be at the “Meet the Designer: New & Indy Tabletop showcase” event on Friday 4 November 2016, 7.00pm in the Tabletop hall. You can pre-register to playtest the game, or just show up and try your luck. And if you miss me at the showcase, feel free to email shannon@foxtalegames.com over the course of the weekend and we can tee up a time to meet and say hello. 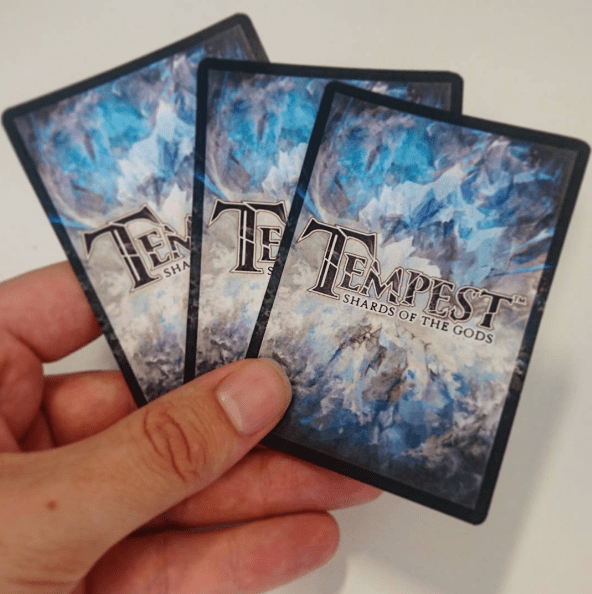 We have printed a bunch of promo cards for Tempest that you can get your hands on. There are two ways to do this. First, you can head on over to the Tabletop Game Designers Australia booth during the Convention to get your hands on a beautiful TGDA Showbag. Inside, you will find two things Tempest-related. First, a USB containing a print-and-play file. Second, a promo card: the Bluecore Cardstock Ronin. There are only a limited number of these bags though, so be sure to get there quick if you want to see the best that Australian board game designers have to offer! The second way is to come say hello during the course of the Convention. 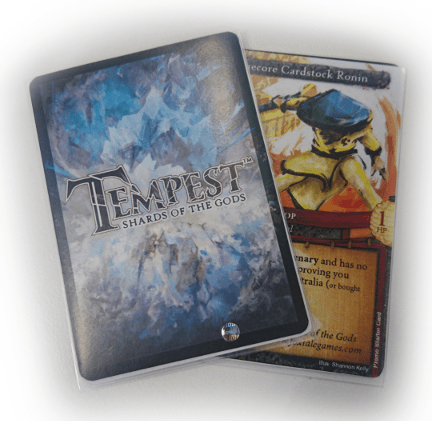 Anybody who sits down to try a game of Tempest will be able to leave with a pretty Bluecore Cardstock Ronin in their pocket. We’re really excited about these cards because they are the first time we’ve printed our card backs on actual card-stock, with a full colour printing job (instead of a home computer on a piece of paper). They have been printed by the lovely folks over at AdMagic. The cards are not “pay to win” in any way, and they’ve been designed to replace one of the starter cards in a Tempest deck (and act identically to that card). If you grab one now and back the Kickstarter later, you’ll be able to swap out your Mercenary card with one of these, forever proving you were there at the beginning. It’s not much, but we’re hoping it’ll be a nice thank you to those who were interested in the game from the start. The name is a bit of a tongue in cheek reference to Mike Krahulik (Gabe from Penny Arcade)’s character, the Cardboard Tube Samurai. Blue-core cardstock is one of the two most popular stocks used for card games (the other being black-core). They are named so because the glue used to bind the two sides of the cards together is an opaque blue or black in colour, to prevent light passing through the card and revealing to the opponent what that card is. Sure it’s out of theme, but it’s fun and it’s a nod to the best convention in the world. 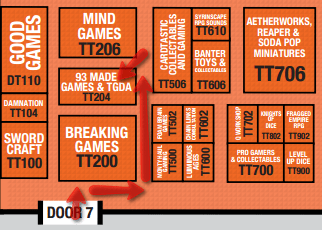 As mentioned above, the TGDA showbags will contain a USB holding a Tempest print-and-play file. This has everything you need to have two players take on the role of Anubis and fight using the Egyptian faction. However, we’re aware that it’s going to get old quickly to play just one faction. We made that print-and-play small to save on space and make it easier (and because the factions aren’t quite balanced yet). If you miss out on grabbing that USB, soon after we come back from PAX Aus, we will be providing that print-and-play on this website, along with an expansion containing the Norse faction. Because we don’t have all of the art done for this faction, the print-and-play will contain a bit of placeholder art, but we know you won’t mind too much!